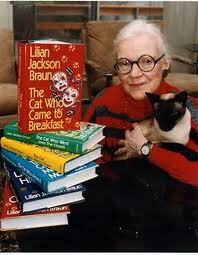 On Saturday, June 4, 2011, Lilian Jackson Braun died at the age of ninety-seven. She was the author of the Cat Who series, which featured former newspaper reporter James Qwilleran and his two Siamese cats, Koko and Yum Yum. I started reading this series off and on from the time I was in elementary school. I loved mysteries and cats, so it was a perfect choice. 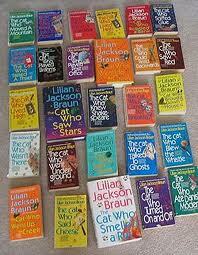 My mom got into the series a little later than I did, and we both own quite a few copies of the Cat Who mysteries. I think reading this series also made me love Siamese cats even more (not that I don't love all cats, but still...). The Cat Who mysteries started in 1966. Three novels were published in the ‘60s, but she didn’t publish another one for twenty years because of the way mysteries were heading during that time. Yet she found a place for her light, humorous mysteries, and I’m glad she continued writing. A quote from her about publishing is “I don’t pay attention to the publishing business. I just write my kitty-cat stories.” She is also quoted to have said, “I always wrote, first for fun, then for an advertising job, then for a newspaper, and then for The Cat Who readers.” Her greatest regret was not finishing her last Cat Who book for her fans. Have you ever read a Cat Who novel? Oh no! I didn't know she died. I love those books so much. Great, fun reads with unusual characters and even more unusual cats.